The Colonial Theatre Box Office window is located at the theatre at 2050 Main Street, Bethlehem, NH. FILM TICKETS: The Box Office opens 30 minutes before regularly scheduled films. CHILDREN’S SERIES: All tickets $6 at the door. Group discount available, please call for information. LIVE EVENT TICKETS: The Box Office and Patio open one hour prior to Live! shows serving beer and wine to ticket holders 21+. IN ADVANCE at these locations: Maia Papaya, 2161 Main Street, Bethlehem, NH (next to the Post Office), and Catamount Arts Box Office, 115 Eastern Ave., St. Johnsbury, VT.
DAY OF SHOW: For day of show ticket purchases and ticket pick-up, the Box Office opens one hour before showtime. We would like to remind you that, out of respect for our artists and fellow attendees, we do not allow photography or recording at any of our events. Not a Member but want tickets at Member prices? JOIN NOW! 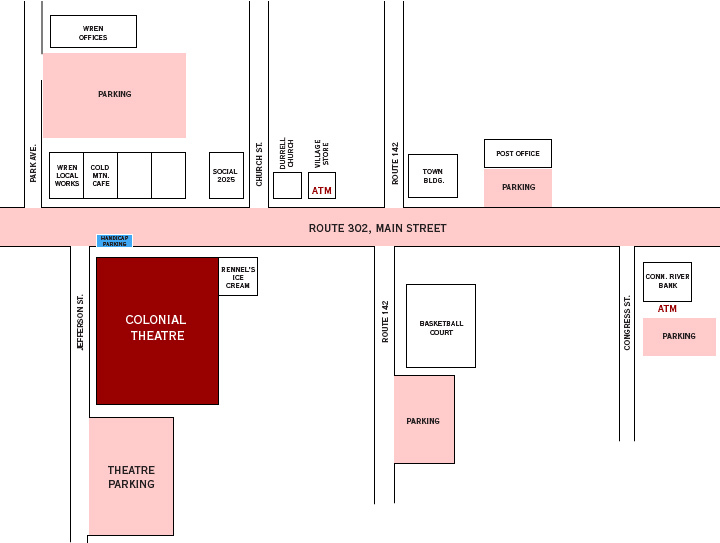 The Colonial Theatre is located at 2050 Main Street (US Route 302) in the center of Bethlehem Village. 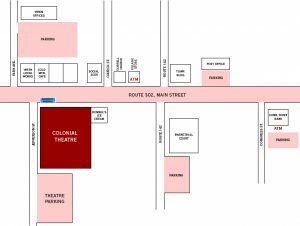 Free parking is available in The Colonial parking lot behind the Theatre. Parking is free on both sides of Main Street and in the areas indicated on the map in pink. Handicap parking is available directly in front of the Theatre at the concession area entrance and is also accessible to the patio. ATMs are available at the Bethlehem Village Store, 2065 Main Street, and Mascoma Saving Bank, 2212 Main Street. Organic Popcorn. Top it off with real butter, salt, brewers yeast or parmesan cheese! 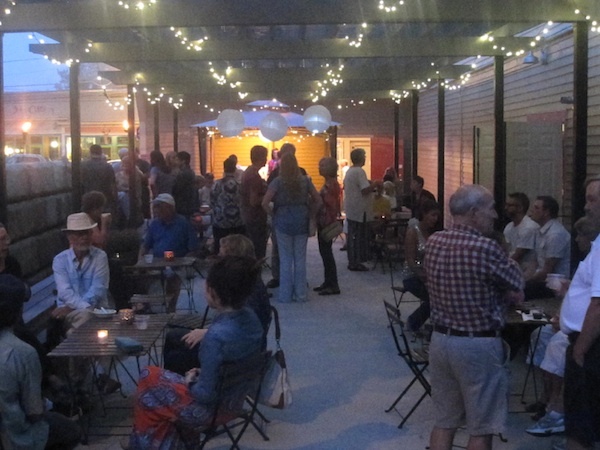 Join us on our 1400 ft covered outdoor patio serving beer and wine during our live concerts and selected special events. Open 1 hour prior to concerts.